Best lego storage ideas for your home. Ideas and inspiration to store, sort and organise Lego in any room. Learn how to organise Legos easily, where to store them, and what to do with the instructions as well – so you can enjoy your collection and keep it manageable at the same time. Perfect! Lego is a great toy for all ages, with endless possibilities of what to create, the only limit is your imagination. But with all that fun comes the harder side of things – how to store and organise them properly. It can be really hard because there are so many small pieces involved, and they can get EVERYWHERE…. So – let’s tackle some ideas and talk about what’s best – so you can use it for inspiration in your own home and get the right solution for you. #1 – HOW SHOULD THEY BE STORED? By colour, by genre, by shape, by set – the list of possibilities is endless. As with everything you organise, ask those who use it how they would prefer to have it stored before you get started. The system will have to work with how they think and how they would like to use it all. #2 – HOW MUCH LEGO IS THERE TO STORE? If there’s a lot, or a little – this will affect where and how you may want to store your Lego. Also think about whether this is the complete collection or whether you need space to grow. Thinking about this up front will save wasting money or effort later. #3 – DOES IT NEED TO BE MOVED OFTEN? #4 – WHO IS USING IT? Lego is a great toy for all ages, so it makes sense to think carefully about who will be using whatever storage you put in place, and making sure it’s suitable. For instance – can they access it easily, can they put it away easily? There’s no point in setting up an organising system that doesn’t work on a practical level – however lovely it looks! Once you know the answers to these questions, it’s time to take a look at the following ideas, so that you can choose one (or two!) that suit your needs the best. 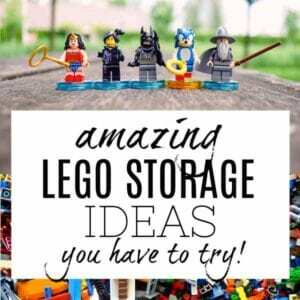 I’ve collected a wide variety of the best lego storage ideas from around the web just for you – and I really hope they help you get it sorted, once and for all! I love the idea of these bags, because they provide an easy way to quickly gather everything up when you’re done – AND they give a dedicated space for the Lego. You simply open it up and you can see all the Lego easily, and when finished, just pull the strings and it becomes it’s own bag. This would be great for younger kids who don’t mind everything all in one group, and can be easily taken to other places as well. Sometimes the simpler the better when it comes to storage – and having one big plastic box may be the perfect solution for those who are happy to rummage around for the pieces they want**. EXTRA TIPS – Why not get one with wheels on if you need to move it around a lot (or you prefer not to scrape the floor! ), and/or one that fits under the bed so that it can be easily stored away as well? Ziplock bags are ideal for smaller selections of Lego – and can all be stored in a drawer, large box, or cupboard easily. Ideally for this solution you would have see-through bags as that will be easier to keep track of what’s where. I like the idea of smaller boxes as well, and there are so many options for this – either open boxes as the picture above shows, or closed ones that stack easily (old takeaway containers would be ideal and a great way to re-use them!). Great looking idea – but always use plastic jars not glass because of safety, and weight! I like this idea in theory – but getting to the top of the storage *may* be an issue for little ones…. A great way to have a very mobile solution is to use a tackle box or similar container (I’ve used plastic containers for things like Loom bands in the past). This is one of my favourite options because it can look so pretty if you have a rainbow effect in the drawers – it appeals to my sense of order! This is the ultimate solution, because you can use the top as a storage area, play area or display area as well! Similar in idea, but different in look – I also like this storage unit with drawers from IKEA and have used it for craft in my house, but can see it working incredibly well for Lego too – CLICK HERE TO FIND OUT MORE. These can get forgotten because they are more simple to store – but making sure you find a great solution for your manuals as well will help to enjoy the Lego all the more. Quick and easy – and can be stored in a bookcase or by the Lego itself. My favourite ring binders are Staples Better Binders, which you can find HERE. Less bulky than a ring binder – just use a ring and hole punch the corner of each set of instructions. This would work really well because you could use a hook to attach the ring to the side of the Lego storage so everything is in the same place. … lastly – why not go really simple and just put into a plastic tub – keeps them together without any hassle, and if you have LOADS then this may be easier than trying to bind them all. 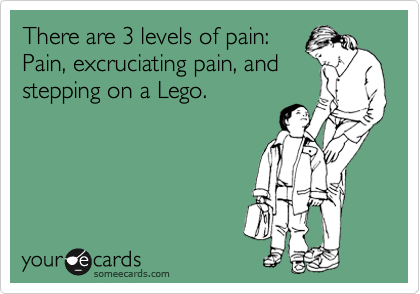 … HOW ABOUT ORGANISING HOW TO PLAY WITH THE LEGO? When you’re using Lego, you need a flat surface that has plenty of space available. This is sometimes hard to come by in a home because the bigger spaces (floor, kitchen table etc…) are usually needed before you’re done. Whether it actually has wheels to roll out or is just a simple board, something cut to a size that fits under a sofa or a bed can be the best solution for quick and easy playing (works really well for Jigsaws as well). How about adding a flat play surface to a roll out storage container, so it’s all in one! #3 – CREATE A PLAY TRAY! What a great idea for a quick and easy table that your child can sit and use pretty much anywhere! LOVE LOVE LOVE this idea, so I definitely wanted to add it at the end of this post. It would work so well to keep little ones occupied when out and about! 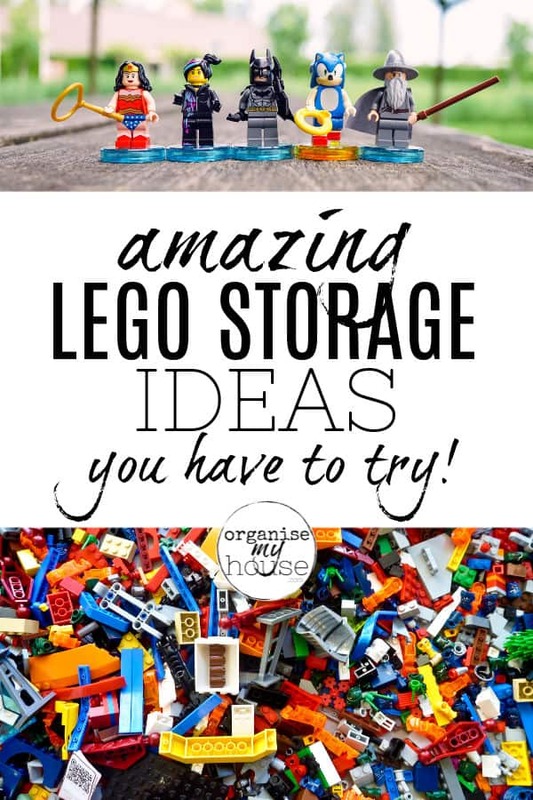 And there you have it – the best Lego storage ideas from around the web, collected together to inspire you! Whether you need to look at storage, how to set up a play area, or what to do with the instructions – there’s ideas galore for you to look at using in your own home.